There is more to surviving on the street (racing is a whole other if similar matter) than wearing gear. Personally I wear all the gear all the time (ATGATT). I really learned to ride on the streets of San Francisco (and Sausalito) as a motorcycle messenger in the early 70’s, and from the start I wore a full face helmet (a Shoei S-20, their first 2-piece structure full face imported into the USA I believe), decent motorcycle gloves, a heavy leather “bomber jacket” and steel-toed “engineer boots” but there were not a lot of gear choices then. Bell started it in modern times with their Star, and Bates was down in Long Beach I believe (now Lakewood); there were very few others in the US and many in Europe who made full leathers, etc.. It just made sense to me to wear gear but I did not have any history with others that really influenced me in this regard. When I started racing it was mandatory even though the tracks were treacherous and not designed for motorcycle safety. If you survived the first 6 months you got cocky because you had many of the skills but not the experience nor developed the 6th sense required to know when some Cager or the road was going to try to kill you; and the next 8 months were the most dangerous. One of my best friends, now about 67, is a Hog rider and never wears a helmet unless he has to by law. He also only wears a leather jacket, gloves and sometimes chaps if the weather demands it. His attitude is that he’d rather die than be a cripple. I try to tell him there is an in between and it’s not that black and white. He is a great and usually safe rider and has slowed down a bit knowing age dulls the senses. With him it is a bit of a macho thing to an extent, and recently after he said he lived by the “ride hard, die fast” credo, I had trouble trying to explain to him Hunter S. Thompson’s famous quote “It’s better to be shot out of a cannon than to be squeezed out of a tube”. My friend is also the luckiest man in the world. If I took the chances he has and failed to maintain his motorcycles as he does (not), I would have been dead 10 times over. But being a safe rider is more than gear, it’s a mindset reinforced with a practiced skill set, willingness to continue learning, much experience and as a said above, a 6th sense for danger. BTW Thumper, studies have indicated that a DOT helmet may actually transfer less g’s (energy) that a Snell helmet, and thus for the majority of incidents be safer. Last edited by skokievtr; 01-22-2013 at 02:00 PM. I had a crash in 1987 that changed my life. I was wearing a helmet and my prized leather jacket. The KZ750 I was riding hit gravel in a left hand curve. I went off the road, high side. I hit a road sign and a telephone pole. My helmet was torn from my head, the back broken open like an egg, chin strap still fastened. I woke up on my back not really knowing where I was, what day it was or my name. The paramedics cut my beautiful and prized leather jacket from me because my right arm was shattered and bent like my wrist 5" from my elbow and the bone was sticking out, amazing how white bone is! I suffered neck and head injuries and it took me weeks to walk again and I am covered with scars. That helmet saved my life. I NEVER ride without proper gear and I demand my passenger do the same. My brother rides without gear even though he saw what happened to me and nothing I say gets through to him. It's his, "freedom". My, "ride hard, die fast", is tongue in cheek because I lived through it. Last edited by twist; 01-22-2013 at 05:24 PM. If u would not have crashed per below, what would u now be wearing? I'm pretty sure EVEN with atg u WOULD NOT STILL have been seriously broken! And the road is included in "they"
I had a crash in 1987 that changed my life. I was wearing a helmet and my prized leather jacket. The KZ750 I was riding hit gravel in a left hand curve. I went off the road, high side. I hit a road sign and a telephone poll. My helmet was torn from my head, the back broken open like an egg, chin strap still fastened. I woke up on my back not really knowing where I was, what day it was or my name. The paramedics cut my beautiful and prized leather jacket from me because my right arm was shattered and bent like my wrist 5" from my elbow and the bone was sticking out, amazing how white bone is! I suffered neck and head injuries and it took me weeks to walk again and I am covered with scars. That helmet saved my life. I NEVER ride without proper gear and I demand my passenger do the same. My brother rides without gear even though he saw what happened to me and nothing I say gets through to him. It's his, "freedom". I must be simple, what the hell are you saying? Good on her for trying to send the right message. She shouldn't forget the leg protection. I wear boots with shin armor, as well as knee/shinguards, AND hip and lower back protection under my pants. Pants/jeans alone will do precisely squat for you if you go down. And whenever I talk to someone interested in buying a bike I always get on my soapbox and tell them to put a few bucks aside for good gear. There's no excuse because most of what I've bought I've done a little homework and bought nice clean lightly used stuff for a real good price. Feels damn good to be prepared when it hits the fan. Last edited by captainchaos; 01-22-2013 at 02:38 PM. I am simple, I missed the original post. In those days I was reckless, I didn't know what I do now. The suspension on those bikes was worthless and it was my first Japanese bike. My Triumph was completely different from that KZ. As they say, young, dumb and full of ***. I get what you're saying, but if you follow this too far I think you quit riding. 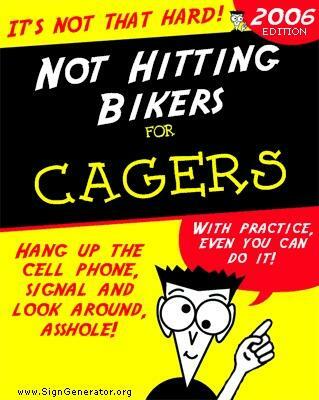 In fact many have quit riding because it is obvious that it is much safer to travel by car than by motorcycle. By riding we are taking a risk that we don't need to take because a car is available, generally speaking. I ride because I love it, but I know it's not safe. Cars aren't totally safe either but much safer than bikes. Its just a cold, hard fact. I wear gear to increase my chances of survival, but I know that my body will easily be destroyed depending on the circumstances of a crash. My biggest concern is being hit by another vehicle. Survival will be up to fate as much as anything.